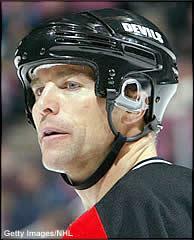 On May 26th in 2000, New Jersey Devils defenseman Scott Stevens decimated the oft-injured Philadelphia Flyers forward Eric Lindros with an open ice hit midway through the first period of Game 7 of the Eastern Conference Finals. The hit represents Lindros' final on-ice moment as a member of the Flyers as he was kept from skating for six months, missed the entire 2001 season, and was ultimately traded to the New York Rangers. New Jersey beat Philadelphia 2-1 and went on to defeat the defending Cup champion Dallas Stars 4-2 in the Finals, hoisting their first Stanley Cup in 5 years. Stevens took the Conn Smythe Trophy as playoff MVP. * See also Today In NHL History - Stevens Hits Kozlov. * See also Today In NHL History - Stevens Hits Kariya.